At AmericasPool you can customize your own pool to have all the features and rules you want. We keep track of everything so all you and your members have to do is make your picks. You get a private pool that only you and your members can see and use, management tools and a page dedicated to your pool. 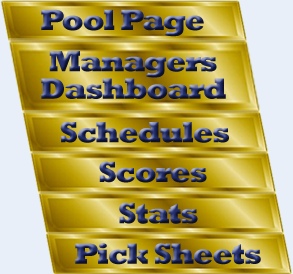 We give pool managers the tools to customize rules, options and features an easy way to invite people to play. Players and pool managers all get the convenience of a friendly place to compete and have fun. You get all the features and fun for only $1 per person for the entire season. No hidden fees, ads, spam or added cost for upgrades. You don't pay until the third week of the regular season (pre-season games are free) - sign up now and try AmericasPool risk free. When you're ready to create a pool, you'll be the pool manager. 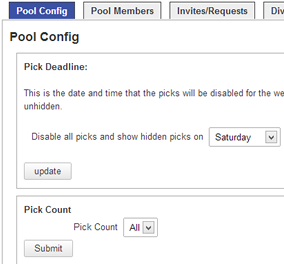 You get to choose the style of pool, set the rules and options, even upload your own pool logo. AmericasPool.com is incredibly flexible so you can create the most fun experience possible. After setup, you'll send out invites using our easy system. That's all there is to creating the best, most powerful pool on the web! Your private Pool Page gives you an easy-to-use site with no advertising or bunk. We provide you with all the features that make it easy to start, manage and be fun for everyone. 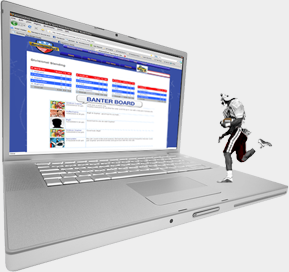 Get fast results on scores and your standings. 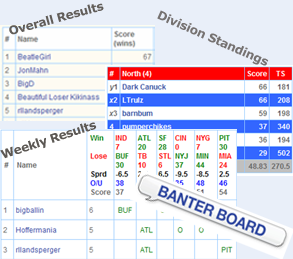 Gloat over a big win by talking trash in your Banter Board. We even have expert analysis with flavor - the outlandish Masked Prognosticator. Sign up now at no risk! Run a pool, play in a pool, have some fun. Accurate tracking and aimed to make your life easier. Only $1 per person for the whole season. Sign up now and try us out risk free. You and your friends, family and co-workers will have a great time! GET STARTED Its really simple. We'll just ask you for a valid email address - which we never sell or give away. You then supply you're own unique screen name and password and you're ready to go! That's it, there is never any risk or obligation! Great football pools since 2008 © 2019 AmericasPool. All rights reserved.